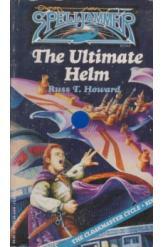 The Ultimate Helm by Russ Howard, Sci Fi. Book is in good condition, all pages intact. Teldin Moore has boarded the legendary Spelljammer, but there are numerous parties who seek to control the vessel. The final battle will determine who will gain the power to rule wildspace and - one way or another - bring Teldin Moore's story to a close. Part of the Spelljammer: Cloakmaster Cycle series.